AK and BK V-Belt Pulleys finished bore pulleys. AK Sheaves are available in 1 or 2 grooves ​and BK are offered in 1 or 2 grooves. 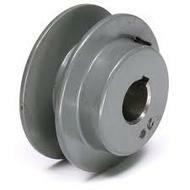 Pulleys are provided shaft sizes are bored to the desired shaft size. Combination groove on the BK Sheaves can accommodate belts (4L, 5L, A, AX, B & BX) for maximum flexibility.